On the 21st of April, LEO hosted its first robotics congress. With over 300 people attending and over 35 robots or robotic applications, the event was an enormous succes. A video on the congress on April 21, 2016. With over 300 visitors and 35 robots. The event was opened by Onno van Veldhuizen (mayor of Enschede), Ed Brinksma (Rector Magnificus University of Twente), and Eddy van Heijum (provincial executive of Overijssel). In a lively discussion with moderator Janinka Feenstra they discussed opportunities and risks regarding the development of robotics for the region. Onno van Veldhuizen made an inspired pitch to utilize Enschede as a launching customer and to continue its tradtion in being one of the most innovative cities in the Netherlands. After the opening discussion Vanessa Evers gave a keynote on the role of social interaction when it comes to robots operating in unstructured environments. Current robots are not aware of social protocols and are therefore often interpreted as rude or impolite. Research done by professor Evers is meant to solve these issues and to make robots aware of the social cues given by people. This is an increasingly important research area as robots are continuously penetrating society. It's obvious that robots in health care need to have certain social behaviours, but collaborative robots in industry are interacting directly with humans as well, and they need the same capabilities. The first theme during the day focused on the latest generation of industrial robots. Mark Peters discussed the manner in which the latest generation of robots can impact the 'flow' of product lines favourably. Martin van de Heuvel discussed the role of Shell as one of the industry's forerunners in robotica and he made a plea for technology developers to contact Shell with suggestions and innovative ideas. During the second theme, three speakers focused on different aspects of healt care. Hans Rietman, Roessingh Research and Developement, focused on robotics in rehabilitation and on the question whether or not the therapist is replaceable. Jorrit Ebben, Siza, discussed the role of robotics in everyday care. He stressed the importance of collaboration between technology developer, patients, and health care professionals. Finally Koert de Jong, UMC Groningen, and Benno Lansdorp, DEMCON, discussed the role of robotics in the cure. They described how robotics can create more accurate and reliable needle steering techniques, all the while leaving the surgeon in controll. The general message is that robotics in health care is progressing, but it is taking time to fully integrate within existing processes. During it all, the collaboration between all relevant parties is essential for successfull implementation. The congress was also the place for the first KIVI / LEO bachelor award. The prize was €1.000 for the student with the best bachelorthesis on robotics. Out of all the nominees, three finalists were selected. The finalists each got 3 minutes to pitch their research to the audience and the jury, which consisted out of Stefano Stramigioli (professor robotics at the University of Twente and vice-president of EuRobotics), Dirk Bekke (lector mechatronics for Saxion Enschede), Dennis Schipper (managing director DEMCON) and Micaela dos Ramos (director of KIVI). In a joint evaluation Tom Lankhorst was chosen to be the winner. Congratulations Tom! During the panel discussion there was a debate on subjects such as the effects of corporate culture on the implementation on robots, the manner in which SMEs can collaborate with knowledge institutions, the unique selling point for the region, and whatever else was brought to the table. Perhaps most noteworhty was the robot exhibition in the Univerity's DesignLab. 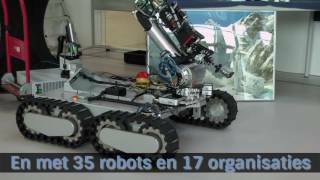 About 15 organizations had brought over 35 robots or robotic applications with them. This gave spectators the chance to witness first hand the possibilities of robots.